The average number of U.S. child heatstroke fatalities from being left alone in a hot car per year is 37. When outside temperatures are in the low 80s, the temperature inside a vehicle can reach deadly levels in only 10 minutes, even with a window rolled down two inches. Children’s bodies in particular overheat easily, and infants and children under four years old are at the greatest risk for heat-related illness. 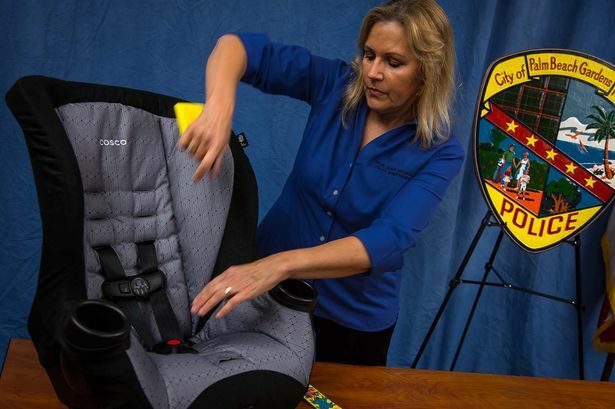 Palm Beach Gardens Police Department seeks to help parents, grandparents and child caregivers prevent the risk of these deaths and injuries from occurring. The “Frog-et Me Not” project uses a colorful frog hang tag as a visual reminder that there is a child in a car seat in the backseat of the car. Here is how it works. The “Frog-et Me Not” hang tag is immediately attached to the buckle of the child car seat. When the child is placed in the car seat “Frog-et Me Not” is removed from the buckle and placed on the key ring and the child is buckled into the car seat. When the parent arrives at their destination and takes the keys from the ignition the “Frog-et Me Not” hang tag hanging from the key ring is an instant visual reminder of the child in the backseat. “Frog-et Me Not” is then replaced on the child car seat when the child is removed from the car. The “Frog-et Me Not” hang tag never leaves the car. If it does, it’s a visual reminder that the child is still in the car.